Chia Seed Pudding: I Get It! Chia seeds are all the rage in the crowds I run with. They are highly nutritious being packed with omega-3 fatty acids, antioxidants and fiber. Plus they are a seed and we should all eat more seeds. For some reason I was resistant but once I tried them I had an Oprah like “aha” moment (you know when she sings/yells “I GET IT”). My friend Roisheen, who gave me this recipe idea, has had all sorts of fun with chia seed pudding toppings with her daughter. Kids like it ’cause it grows. It is a rather bland base and easy to make your own. Allow chia seeds to soak up water for about five minutes. Then add “mix-ins”. I used a few frozen strawberries and a splash of almond milk. Hey! I get it to! Lol. It’s so good, and so easy to make that you forget you put it in the fridge. Then you eat pudding for breakfast the next morning! I have found that using chocolate almond milk instead of water makes for a pretty delicious and even simpler pudding. I’m making a big batch tonight! Can’t wait. Sharon that sounds heavenly! You may have to start adding recipes to your beautiful blog :). I’d certainly like to learn more about Malaysian foods! I *do* know when Oprah sings/yells “I GET IT!” And now I know that Chia seeds exist. I feel very in-the-know right now. 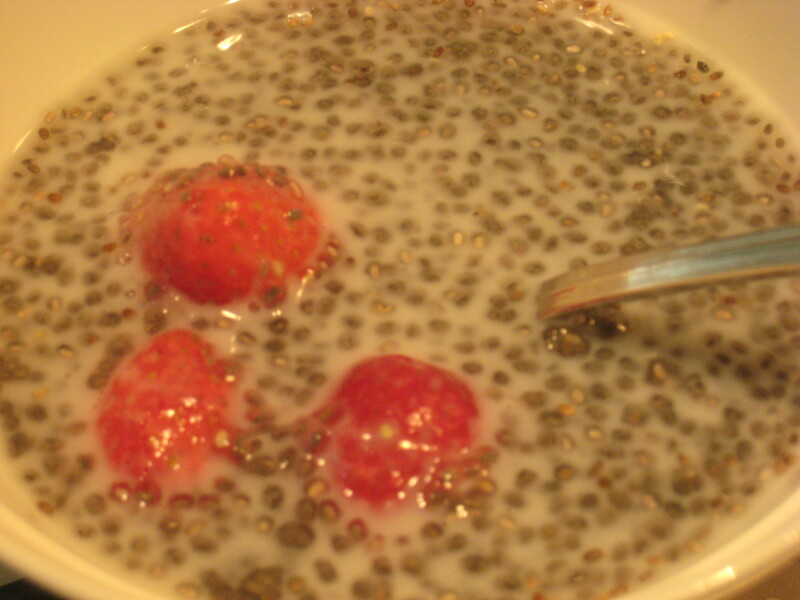 Sounds delish and I need an update on my chia pudding–I’ll check it out thanks!